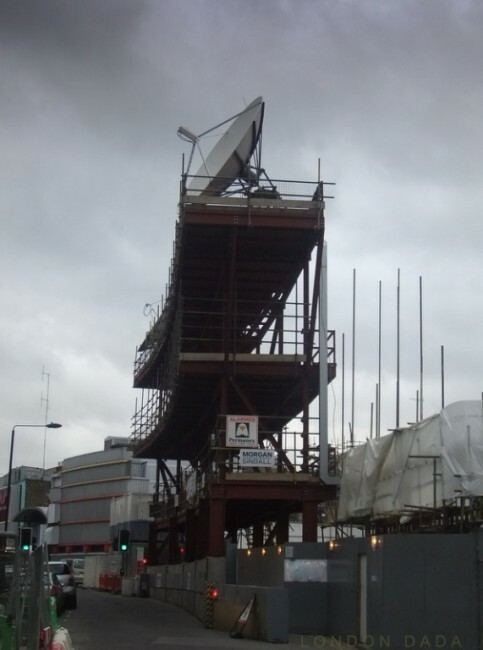 Broadcast media Studio / office construction site, Camden. Futuristic narrative on the ever-increasing volume and range of digital data streaming into our daily lives, which nonetheless remain strangely vacant and devoid of a sense of substance and inner security. The incredible satellite dish (one of two) dominating the skyline and belittling the steel girder skeleton of its new build support, struck the eye as interestingly unusual and in an as then ( Dec ’11 ) vague sense promising some kind of sinister potential along social commentary lines, the image and its long deliberated-over title eventually coalescing. The pic is cropped and altered in Photoshop by applying a top-down graduated tint to give the sky ( direction from which the infotainment stream arrives ) a fittingly ominous feel.